Comprehensive joint health formula that supports joint health and function in dogs and cats, combining the benefits of glucosamine and chondroitin. Available in a 90ct bottle. Beef Liver Flavor System, Magnesium Stearate, Maltodextrin, Microcrystalline Cellulose, Silicon Dioxide, Sorbitol, Stearic Acid, Sucrose Natural Sweetening System, Tricalcium Phosphate, Vitamin E Acetate, Whey Protein. 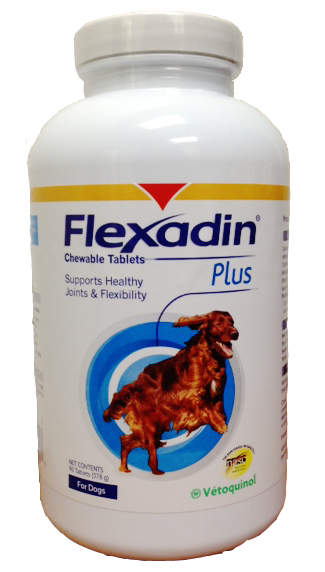 Flexadin tablets may be given directly to the dog or cat, or at mealtime.